AUSTRALIAN cattle prices are forecast to fall by 8 per cent in 2018-19, as the Australian cattle herd expands for the third consecutive year, according to ABARES’ mid-year projections released today. The official Government economic forecasting agency believes the weighted saleyard price of beef cattle will average 420 cents a kilogram next financial year. This is just 8 percent higher than the 10-year average. 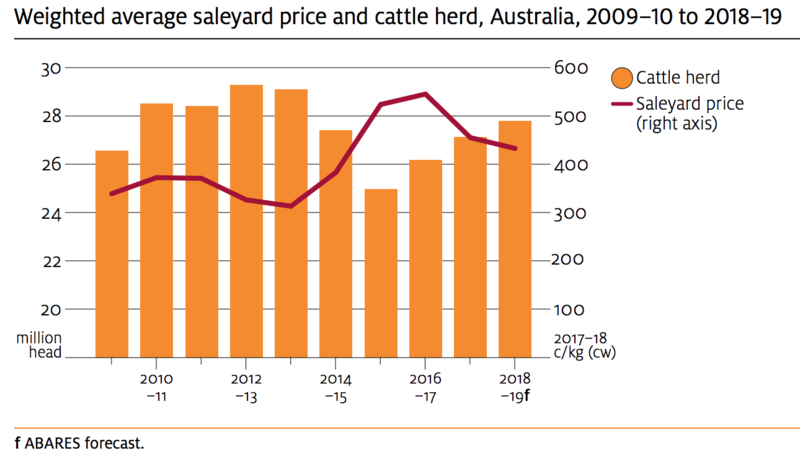 A 3pc rise in the Australian cattle herd to 27.8 million in 2018-19, assuming a return of average seasonal conditions after a dry winter. This is marginally higher than the 2013–14 peak of 27.1 million head. Export prices to fall slightly in 2018–19 – chilled beef prices 4pc lower as a result of weaker demand and increased competition in the Japanese market, frozen beef prices to rise 3pc as a result of tightening cattle supplies in the United States. Cattle slaughter to rise 4pc to 8 million head. Average cattle carcase weights to decline 1pc from record 284 kg in 2017-18. Beef and veal production to increase 2.5 per cent to 2.3 million tonnes (carcase weight). Beef exports to increase by 3 per cent to 1.1 million tonnes (shipped weight), with most of the increase to be shipped to China where strong income growth continues. Beef exports to China to increase 18pc to 160,000 tonnes, following a 30pc increase in 2017–18. Beef exports to US to hold firm at 230,000 tonnes, with US production of lean manufacturing beef is forecast to rise due to higher feed prices increase cow and heifer turn-off.Beef exports to Japan to rise 6pc to 320,000 tonnes, with the increase comprising mainly cheaper frozen cuts. Live cattle exports are expected to rise by 4 per cent to 925,000 head. Indonesia and Vietnam are expected to remain the primary destinations Prices to remain historically high, around 30 per cent above the $894 per head (in real terms) average of the past 30 years.